Power Down for Earth Hour and Win! Power down at work and home for Earth Hour. Take part in Earth Hour 2019 and help us in shine a light on climate change. Take the pledge and join millions of people around the world in powering down lights and electronics for one hour on Saturday, March 30 from 8:30 – 9:30PM local time. Red River College is powering down for Earth Hour and we need your help. Non-essential lights will be turned off during the hour, and we ask that before you leave for the weekend you shut down your computers, unplug unnecessary electronics and turn off your lights. Because Earth Hour is on the weekend, we can make a bigger impact if members of our College community pledge to power down at home. This year, all staff, students and faculty who take the pledge will be entered to win a Earth Hour Prize pack: Enjoy a candlelit game night with friends or family with a board game, handmade candles and some delicious sustainable snacks. The pledge form is now closed. Thank you to everyone who pledged! The hustle and bustle of the holidays requires a lot of energy! But while you’re amped-up getting everything done, let’s make sure the College’s electronic equipment and appliances are getting a much needed energy break. Red River College is closed from December 21 to January 2. During this time the College’s major building systems will run in “Un-Occupied Mode”, which means lower temperatures and, in most cases, minimal ventilation. This will help reduce our energy consumption, and our environmental footprint. But you can help too! By participating in the Seasonal Shutdown Office Challenge your actions can help to achieve higher energy savings. Plus… by participating you could win a catered coffee break for your office. Where it is safe and possible to do so. Please leave printers ON, they’ll go into energy saving mode on their own. We’re pleased to announce that the Plug Load Inventory is now complete! Our small team traveled around the College over the last few months, poking our heads into offices and staff common areas and taking note of all items powered by means of an AC outlet. Now we begin the hard work of creating and implementing impactful programs to help us reduce our environmental and financial footprints and to ensure a safe and comfortable work environment for us all. Refuse, Reduce, Reuse and Recycle this Waste Reduction Week – and Always! RRC is celebrating Waste Reduction Week from Monday October 22nd to Friday October 26th to engage and raise awareness on how much waste we as individuals create, and the easy changes we can make to reduce this. This is also an opportunity to celebrate the changes we have made, and the impacts both of these can make on the health of our planet environmentally, socially and economically. Since the 1950’s 8.3 billion tonnes of plastic has been generated globally. Only 23% of those plastics have been recycled, and it is estimated another 12 billion tonnes of plastic will end up in the landfill by 2050. About 40% of all waste produced at RRC is diverted from the landfill through reuse, recycling or composting. This is our chance to mindfully take a look at our behaviors, actions and habits and evaluate what we are doing well and what we need to change. Join in on our events this Waste Reduction Week to learn more about yourself and your consumption habits, and make some easy changes with a BIG impact. RRC offers a variety of waste reduction programs available to all staff, faculty and students, so take a look and make sure you’re using them all! Get Caught in The Act – Use your Reusables! Sunday, April 22nd is Earth Day – a worldwide event to celebrate our planetary home and to show our support for a healthy, sustainable environment. At the RRC Sustainability Office, we think that one day is just not enough to celebrate our Earth, so we’re hosting Earth Week Celebrations April 16-23! Find out the details below. Springtime means spring cleaning. Now’s the time to securely dispose of electronic waste in an environmentally responsible manner. Allowable items include: computers and computer equipment, printers, stereos, speakers, cellphones, microwave ovens (for a complete list click here, or contact us). Please note: College assets must be accepted by someone at Shipping and Receiving to ensure they’re disposed of properly. * Please ensure that private data is removed prior to dropping off personal equipment that may contain confidential information. Red River College and Powerland do not accept liability for data or any other digital content left on your device. The Resource Reduction Specialist, is hard at work developing strategies to help the College reduce paper and plug-load energy consumption. But it can’t happen without your help! Drop by our first consultation session to learn more about where we are, what are plans are going forward, and share your ideas. It has been another exciting year at the Sustainability Office! Come to find what we’ve been up to this year and what’s in store for the future. Can’t make it? Stream it live? With Winter hanging on longer than anticipated, we’ve decided to postpone this event until we all thaw out and it starts to finally feel like Spring. Stay tuned for for the new date and details soon! Did you know, the New Zealand Government has acknowledged a river as a living entity and a park as having Human Rights? Let’s jump on board and Be-Leaf in our abilities to help Mother Earth! Students in the Aboriginal Program for College Enrichment and Transition will be offering staff and students the opportunity to plan how to help Mother Earth. Participants will write their idea on a paper leaf and attach it to the APCET idea tree. The tree will stay up in the hallway until Friday April 20th. When the foliage is removed and recorded, it will be forwarded to the RRC All-Staff News and the RRC newspaper; The Projector. There will be trees, shrubs, perennials, prairies, tropicals, desk gardens, succulent gardens, terrariums, edibles and annual plants for sale. Cash only please – we cannot take debit or credit cards. Please bring your own boxes and bags to transport plants. The Library has pulled together some great resources for Earth Day to help you learn more and take action on various sustainability issues. The Downtown BIZ is hosting a Downtown clean up: Team Up to Green Up on Monday, April 23. Sign up as a team to help clean up downtown and win prizes! FortWhyte Alive has a full day of family activities planned for Earth Day on Sunday, April 22. Admissions is free all day. Earth Hour a Success – What’s Next? On Saturday, March 24 we joined millions of people around the world in powering down lights and non-essential electronics for Earth Hour 2018 from 8:30-9:30 PM. 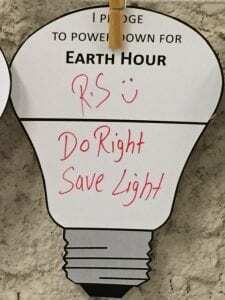 pledged to participate in Earth Hour at home! Thank you to everyone who participated for continuing to show your support for sustainability and for climate action. And congratulations to Lindsay who won the draw for an Earth Hour prize pack. 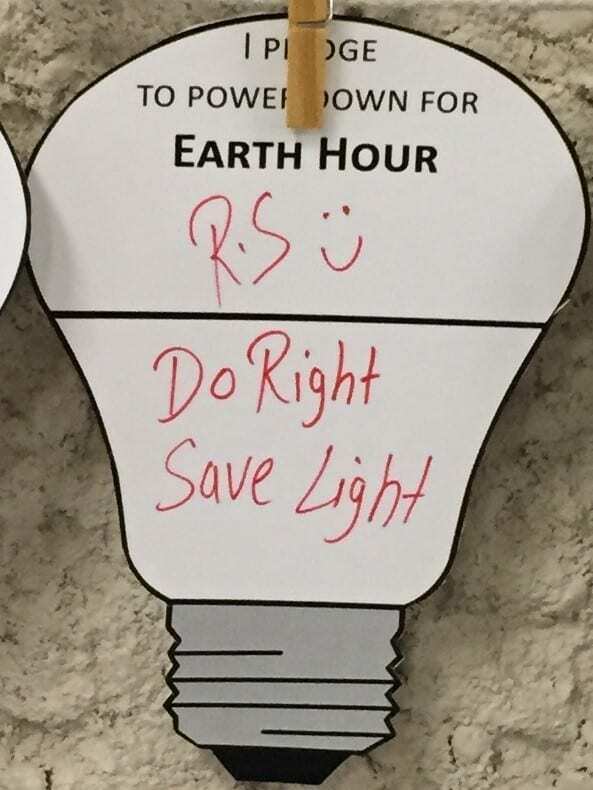 One way RRC is taking action to reduce our environmental impact is to engage staff, faculty and students in reducing plug load energy consumption. Stay tuned for announcements coming soon on how you can learn more about what we are planning and how you can share your ideas for reducing energy consumption at the College. Join us in shining a light on climate change for Earth Hour 2018. Millions of people around the world will power down their lights and electronics for one hour on Saturday, March 24 from 8:30 – 9:30PM local time. Did you know that the College spends about $555,935 annually powering products plugged into AC outlets and lighting? 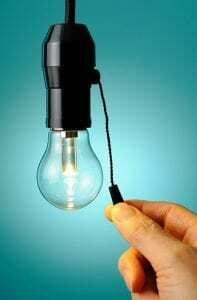 Powering down lights and electronics when possible can save a lot of money! Because Earth Hour is on the weekend, we can make a bigger impact if members of our College community pledge to power down at home. This year, all staff, students and faculty who pledge will be entered to win a Earth Hour Prize pack: Enjoy a candlelit game night with friends or family with a gift certificate to a A Muse N Games, locally-made candles and some delicious organic snacks. Earth Hour is done for this year. Thanks to everyone who pledged! Are you 18-30? Looking to Start a Green Career? Join us! Are you a youth interested in starting a career in the sustainability sector, but having a hard time getting a foot in the door? If so, this may be the opportunity you’ve been looking for! The United Nations Association of Canada’s (UNA-Canada) Canada Green Corps program connects un- and underemployed youth with employers in the green sector. Participating employers receive a subsidy to hire youth who bring their talents to the table and gain meaningful work experience, gain new skills, and make valuable connections to help kick start their green careers. Here at the Sustainability Office we’re excited to be participating in the Canada Green Corps program. The Resource Reduction Assistant will play an essential role in establishing baseline data and developing programs and strategies that engage staff and students in campus sustainability. Over a six month term, the work will focus mostly on plug load energy and paper reduction interventions, however there will also be waste reduction and diversion components and an opportunity to work on other sustainability issues at the College. This position provides an exciting opportunity to be part of the planning and creation of sustainability programming at a large institution named one of Canada’s greenest employers. Read more about the position here. Don’t forget to shutdown all unnecessary lights and electronics before you leave for the break. The winter break is fast approaching and we’re making a list and checking it twice – our seasonal shutdown checklist that is. With the College being closed for 10 days, we’re asking for your help to clean up and shut down before you leave for the holidays. Over the break, the College’s major building systems will run in “Un-Occupied Mode”, which means lower temperatures and, in most cases, minimal ventilation. This will reduce our energy consumption, and our environmental footprint, while the College is shutdown. We can increase that impact by everyone doing their part to ensure unnecessary lights and electrical equipment are shut down. So, before you dash away into the night, please go over the checklist below to help save energy and reduce our collective footprint at the College this holiday season. NOTE: Printers should be left ON, they’ll go into energy saving mode on their own. Electronics items use standby (or phantom) power even when you aren’t using them, so where possible unplug these items. Lab equipment: Together with your colleagues identify equipment that can be safely turned off, unplugged, or placed in standby mode over the break. Do a department walk-through to ensure valuables are secured; lock cabinets. Activate alarms if applicable before you leave. Set yourself a reminder in your calendar or on your phone (or even on a sticky note on the door) to remember to do your season shutdown checklist before you leave. Set yourself a reminder for when you return from holidays to plug needed items in or turn them on. Use this checklist for whenever you’ll be away for an extended period of time (long weekends, vacation, term breaks). When you book the time off in your calendar, add a reminder to do this as well with a link to this blogpost. Don’t forget to water plants and feed and water vermicomposting worms! Energy and paper reduction are consistently listed as sustainability priorities by RRC staff, prompting the recent addition of a Resource Reduction Specialist (Whitney Crooks) to the Sustainability Office. Whitney is looking forward to working with all of you in the new year on identifying opportunities for reducing paper and plug load energy use on campus. Until then, have a safe and happy holiday! Subscribe to Red Goes Green news to get posts sent directly to your inbox.